The new Field Scout Direct Soil EC probe permits direct measurement of salt and conductivity in soil media as well as irrigation water or nutrient solutions. 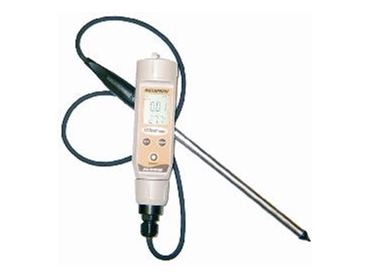 This portable EC meter and probe is perfect for spot soil salinity testing in greenhouse soil media or turf without conducting tedious soil sampling and soil preparation techniques. Greenhouse production managers can compare readings from plant to plant and adjust their fertility program. They can make measurements directly in the plug tray cell without destroying the seedlings due to an innovative paired sensor for higher contact and accuracy. The Field Scout Direct Soil EC probe allows turf managers to monitor salt levels on golf course greens and determine when to flush (leach) salts before turf quality declines and can check the water quality or nutrient solutions as well as soil temperature by using the same probe. Conductivity (or EC) is the measurement of total dissolved salts in a solution - the factor that influences a plants ability to absorb water. In horticultural applications, monitoring of salinity helps manage the effects of soluble salts on plant growth. EC is a meaningful indicator of water quality, soil salinity and fertiliser concentration. The new Field Scout Direct Soil EC probe is available from John Morris Scientific .